The comeback kids were out in force as Geneva was selected as the venue to launch a number of returning heroes. Cars like the all new Honda NSX, Ford GT and Focus RS emerged after lengthy slumbers. Whereas Mazda set the latest version of their long-running MX-5 free, whilst Honda let the public loose on the new incarnation of the Civic Type R. Here’s a look at these five re-births. The development of the brand new Civic Type-R has been a relatively public process. The initial concept was unveiled to the world round about a year ago and we got to see the production model for the first time in Geneva. The RMS verdict ranged from frothy mouthed excitement to ambivalence. That said our RMS photographer would by a microwave as long as it carried the red ‘H’ badge. The Type-R heritage is obvious and the classic ingredients are all there – Brembo brakes, the aluminium gear knob and Championship White paint. What is new is the turbo-charged power plant, with 306 BHP and massive 295 lbs ft of torque at only 2,500 RPM. The peaky vtec days are long gone. Jury’s out on whether that’s a good thing or not. Whilst the Civic Type-R has grown up and got bigger, it’s also drifted away from the lightweight, light-footed, normally aspirated hot-hatch it once was, but the end result seems the same. RMS will reserve judgement until we get the chance to compare! The perennial forum favourite is now entering its fourth generation. The MX-5 remains the best selling roadster of all time, so Mazda were keen not to mess with the car’s iconic credentials. The end result is an all new MX-5 which is lighter, smaller and wider than the car it replaces. The edgy styling is the right blend of purpose and style. Add brand new SkyActiv high compression engines into the mix it is clear that the MX-5 has the potential to become the best value money fun that money can buy. Geneva marked the European debut for the all new Ford super car. Details are still a bit thin on the ground but what we do know is it’s clearly inspired by the GT-40 cars of the sixties and its stunning. Apparently a very limited production run will kick off in 2016 and the car will be V6 twin-turbo and mid-engined. Ford has said that the car will be one of the lightest on the market to ensure a crazy power to weight ratio. Alas, this may well be the closest we will get to one in the flesh. This is Ford’s third Focus RS and it has the potential to be the best ever. Over 300 BHP, four-wheel drive and a drift mode make this a very highly anticipated car indeed. Ford say that their latest fancy drivetrain trickery will enable drivers to hang the back end out at the push of a button. You will not be surprised to learn that Ken Block hand a hand in the car’s development. It will be a five-door only and despite some Ford signature touches, the looks appear to divide opinion. The RMS team weren’t entirely convinced it looked special enough to distinguish it from already available Focus ST.
How do you replace a legend? In Honda’s case, you didn’t. It was easier not to. 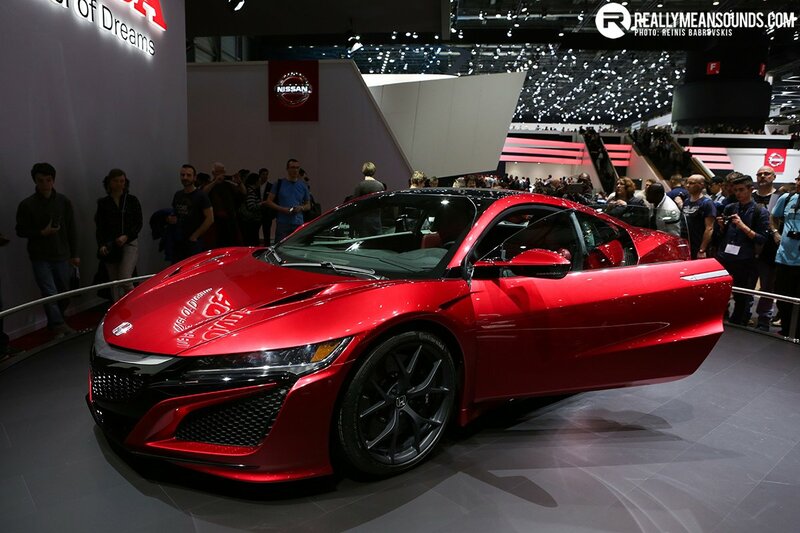 Thankfully, they relented, rose to the challenge and the end result is a new NSX that is every bit as striking as the first and a total technical tour-de-force. In keeping with the original, the car is hand-built and has a V6 engine. Where the Honda comes bang up to date, is by using three electric motors to provide a total power output in excess of 550 BHP. Honda have insisted that the new NSX must retain the former’s reputation for being a “useable” supercar, so the NSX will have four switchable chassis settings, including an electric only, quiet mode which allows the car to be driven on battery power for short distances. But never fear, the other settings include “sport”, “sport+” and “track”, to maximise the intelligent power delivery. Definitely one of the most exciting things about the Geneva Motor Show - being one of the first to see all the big new releases. Pub bragging rights winner for sure. I think the new MX5 was one of the last "proper" reviews on Top Gear, may it rest in peace. I do like the new Mustang, mostly because it looks cool, v8 and now I'm RHD. It missed your list though :(. Agreed both the focus and Type-R are uninspiring. Not a fan of the new MX5 at all. Probably drives fantastic, but I think it's taken a step backward cosmetically. The Ford GT looks fantastic. I'm a big fan of the original (as in, the last one - not the original original from the 60s) and have spent plenty of time poring round the examples which always appear at the NEC Classic Car show and the like. They have massive presence - very low and very wide, the rear tyres alone are something to behold - and I'm glad to see the new one hasn't deviated too much from the formula that works. The NSX looks the part too, though I will admit there's a very small part of me wishes that Honda had used more styling cues from the original car. The new one is inarguable a very attractive looking car, but cosmetically it conforms to the usual supercar design school of thinking - it's not a million miles away from a typical Ferrari/Lambo shape, or even the recent MClaren range - beautiful but nothing revolutionary. Still, the real rest will be how it drives. Agree on the NSX. Totally diagree with you on the MX-5 @Gaz To me, that's the nicest incarnation since the original pop-up headlight model. I love what they have done with the lines and styling - especially the front lights. It's very hard to make a roadster that has great all round appeal and I think Mazda have totally nailed it. @Reno_LV also took pictures of the white version. Check out that picture and see if you feel any different. I've looked at it in all different colours and just can't warm to it. The front isn't too bad, but the rear end looks like a cheap knockoff copy of the Jaguar F-Type's rear and doesn't seem to conform with the rest of the styling at all. And I feel the wheels look a bit lost, though that's arguably function over form which you can't knock. As a whole, I think it looks less consistent overall than the previous model and more reminiscent of cheap Korean/Japanese convertibles than it really should be. But it's just my opinion, it's obviously a subjective thing.